In Japan, any property you buy will likely not increase in value over time. Structures themselves, whether houses or condominiums, lose value as a matter of course because that’s the way the government and the housing industry planned it. And since the end of the bubble economy of the late 80s, even land prices have dropped and continue to do so, thus contributing to the cycle of deflation that keeps the economy in the doldrums. The only exception to this trend is Tokyo, and the media has lately been reporting on how healthy the condo market is in the capital, but according to AERA it’s only specific areas of Tokyo, and not necessarily the ones you might expect. For instance, the “3A area” of Aoyama, Azabu and Akasaka–expensive locations favored by well-to-do expats–has been losing value steadily since the so-called Lehman Shock because of decreasing demand for rental property. But there are locations that AERA says offer “some hope” for the future, meaning that if you buy a condo in these locations the value won’t go down “that much.” These properties lie in a “golden triangle” whose points are Akihabara station, Toyosu station and Shinagawa station; in other words, parts of Minato, Chuo and Koto Wards, especially the waterfront district, which has become very popular among the boomer generation’s own progeny, who are now entering middle age. There’s one exception, and that’s Sumida Ward, or, at least, parts of Sumida Ward. Earlier this year, a condo complex called Oacity near Kinshicho station opened model rooms and put on sale 850 units in three phases. All the units in each phase sold out on the first day, even though the complex won’t be completely finished for another five years. Many units were so popular they had to be chosen by lot. Why is a condo in the usually ignored Shitamachi district so popular? 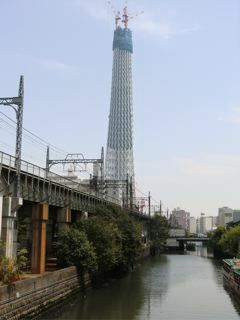 Three words: Tokyo Sky Tree. Apparently, any new building, and even quite a few old ones, with an unblocked view of the new TV tower is a hot property. Since there are very few tall buildings in that part of Tokyo right now, it’s relatively easy to find an unblocked view, especially given the fact that the completed tower will be more than 600 meters tall, but you can definitely expect more high rises to go up in the next few years. In fact, there’s a good possibility that the folks in Oacity who purchased an apartment with a theoretical perfect view of the Tree might not have one by the time they move in if, in the meantime, some other developer builds a higher condo that blocks it. In that case their property value will plummet. The better the view, the more money you can get, and the fiercer the competition.